On Wednesday, Nneka Ogwumike and Dynamo Kursk shook off a slow start to remain the only unbeaten team in the competition after winning 84-70 in Mersin. Sonja Petrovic led the way for USK Praha again as they went to Krakow and beat Hind Ben Abdelkader and Wisla 90-70. An exciting game closed the day in France as Lattes Montpellier held off Fenerbahce 58-56. On Thursday, Schio remained in the best position to challenge the top teams in the group after easing to a 91-46 win in Gyor. On Wednesday, it took a dominant second half for Brittney Griner and UMMC to win 82-56 at Sopron. Polkowice welcomed back both Musina sisters and got a good game from Jamierra Faulkner, but still could not pick up their first win after falling 65-59 to Clarissa Dos Santos and Polkowice. The day ended in Villeneuve as the hosts beat Tiffany Mitchell and Nadezhda 83-71. On Thursday, Katsiaryna Snytsina and Hatay kept their hopes of advancing alive with a 68-64 win over Avenida. Amanda Zahui B and Nadezhda are in second place in Group B with a 7-1 record. All games in this group were on Wednesday, starting in Russia, where Nneka Ogwumike and Dynamo Kursk beat Wisla Krakow 96-59 to remain the only unbeaten team. Fenerbahce helped widen the gap between the teams in the quarterfinals places and the rest of the field by beating Schio 77-64. Brianna Kiesel led all scorers, but Gyor lost 83-56 at USK Praha. 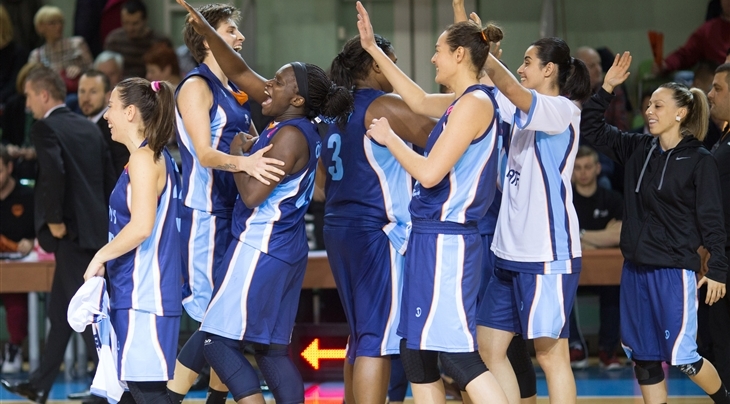 Lattes Montpellier stayed firmly in a playoff place and kept Gintare Petronyte and Mersin winless 76-63. Half of the games were played on Wednesday as Polkowice was no closer to their first win even with a good game from Isabelle Harrison as Yvonne Turner and Shenise Johnson fired Sopron to the 76-64 win. Bourges won the battle of French teams 63-42 over Villeneuve to contribute to the pileup of teams in the middle trying to break for the last playoff places. The top two teams in the group hosted the games on Thursday and both won. 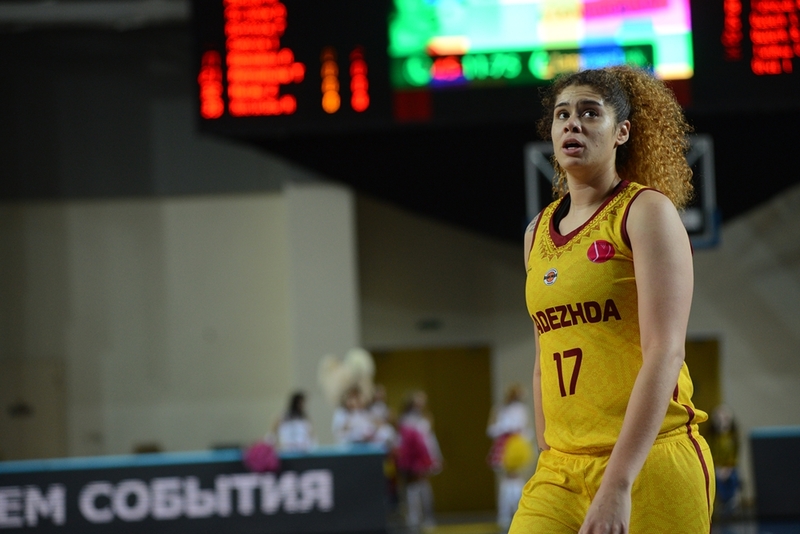 Diana Taurasi and UMMC held off Jelena Milovanovic and Avenida 74-68 in Ekaterinburg. In Orenburg, Courtney Paris was busy in the post for Hatay, but they still lost to Nadezhda 63-54. After the holiday break, play resumed as we have reached the halfway point of the regular season. All games in this group were on Wednesday, starting in Russia, where Angel McCoughtry and a near perfect game from Maria Vadeeva helped Dynamo Kursk remain the competition’s only unbeaten team with a 90-55 win over Gyor. In the matchup of Turkish teams, Jantel Lavender and Fenerbahce left Mersin with an 89-73 win. Sonja Petrovic and USK Praha stormed back at home to beat Schio 74-73 as they also welcomed Candice Dupree back to the team. Geraldine Robert and Lattes Montpellier sit in the last playoff place after a 74-68 win over Wisla Krakow in France. Games in this group started on Wednesday in Hungary as Villeneuve left Sopron with a 72-62 win. Bourges beat Hatay 68-55 as a crowd of teams continues to jockey for position in the middle. Tiffany Mitchell and Nadezhda shook off a slow start in Salamanca to beat Avenida 64-49. On Thursday, Polkowice managed to hang tough for a while at home in search of their first win, but the combination of Brittney Griner and Diana Taurasi helped UMMC control the second half and win 77-64. Dynamo Kursk remains undefeated in Group A led by Angel McCoughtry’s 18 points and 8 rebounds. All of the games in this group were on Wednesday, starting in Hungary, where Lattes Montpellier left Gyor with a 65-58 win. Fenerbahce came back to beat Sonja Petrovic and USK Praha 75-71 as both teams looked to battle for position at the top of the group. Wisla kept Mersin winless by edging them 59-56 in Krakow. Dynamo Kursk had to battle back in the second half in Schio to remain undefeated 79-75. Hatay BSB are celebrating an historic first home victory in EuroLeague Women after they outlasted Uniqa Sopron 74-66 . Wednesday’s games started with a battle of Russian teams in Orenburg, where UMMC Ekaterinburg jumped out to a big lead on hosts Nadezhda and handed them their first loss 88-59. Alina Iagupova dominated proceedings in Villeneuve, leading the hosts to a 75-55 win over Polkowice. The day ended in Salamanca with Avenida beating Bourges 63-50. The last game before the holiday break was on Thursday as Barbara Turner and Hatay beat Sopron 74-66. All games were on Wednesday, starting in Turkey, where Gyor beat Mersin 74-65 with both teams searching for their first win of the competition. At the other end of the standings, Sonja Petrovic had a big game for USK Praha, but it proved too difficult to hand Dynamo Kursk their first loss in Russia as they fell 69-66. Fenerbahce kept pace with a 72-64 win over Sandra Ygueravide and Wisla in Krakow. Lattes Montpellier narrowed the gap with Schio and the top half of the standings after a 69-66 win in France. Wednesday’s games started with an excellent game in Turkey between undefeated teams as Angel McCoughtry and Dynamo Kursk were able to overcome good games from Sandrine Gruda and Allie Quigley to beat Fenerbahce 72-69. It was also tight in the Czech Republic as USK Praha edged Lattes Montpellier 61-59. A battle of winless teams on Thursday in Hungary went to Meighan Simmons and Wisla Krakow 91-61 over Gyor. The week ended in Italy with Schio beating Mersin 71-64. The first game in this group was played in Turkey on Wednesday. USK Praha had a great start on the road, but then had to hang on to fend off Mersin 75-69 with Sonja Petrovic leading the way. A back and forth game in Krakow saw visiting Schio escape 76-75 even though Ziomara Morrison had the edge in the battle in the post for Wisla. A day of road success continued with Dynamo Kursk visiting France and blasting Lattes Montpellier 88-50. The away team trend continued with the lone Thursday game as Fenerbahce escaped Hungary with a surprisingly lackluster 64-66 win over Gyor. The frontcourt cavalry certainly arrived on time for Fenerbahce as Sandrine Gruda was critical to helping them past Lattes Montepellier 69-63 in Istanbul on Wednesday. An infusion of a WNBA champion was also key in Russias as Nneka Ogwumike led Dynamo Kursk to a 73-67 win over Gintare Petronyte and Mersin. Sonja Petrovic and USK Praha rolled past Wisla Krakow 84-63 at home. 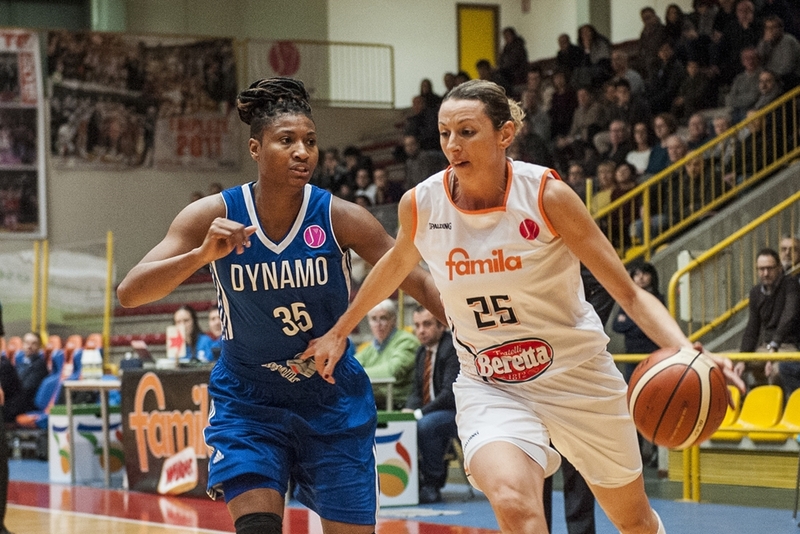 The only Thursday game of the week was in Italy, where Endy Miyem and Schio beat Gyor 77-65. The first week of the new EuroLeague season started with games spread across Wednesday and Thursday. The opening game was in Turkey as Lattes Montpellier had a good start and went back to France with the 74-68 win as balance helped overcome a big game from Marissa Coleman. Prodceedings were also close in Poland, where Dynamo Kursk escaped back to Russia with the 67-61 win over Wisla Krakow. Czech powerhouse USK Praha welcomed Gyor back to the competition on Thursday by going to Hungary and rolling to a 90-51 win. The day finished with an exciting game in Italy as Fenerbahce returns to Turkey with 75-73 overtime win over Schio thanks to a big game from Allie Quigley, offsetting the work of Jolene Anderson for the hosts. EuroLeague Women 2017 Set to Start October 27th! The EuroLeague Women will begin their campaign on October 27th. With 16 teams in the competition from all across Europe. 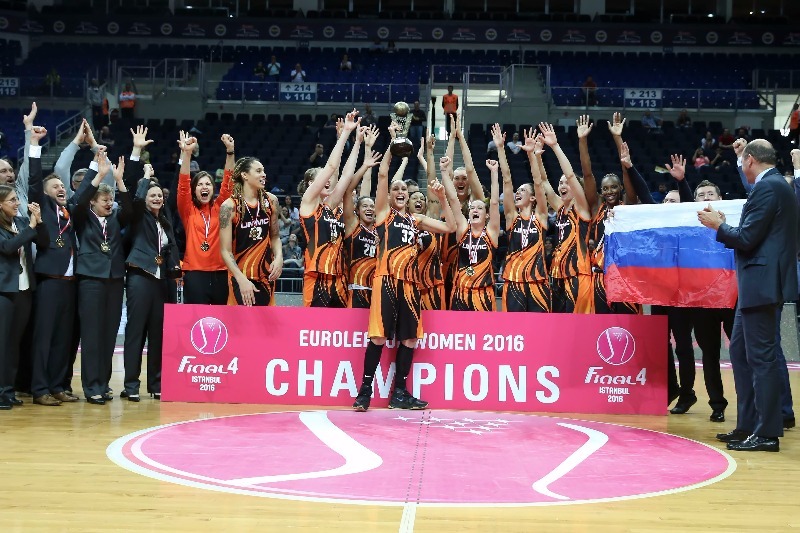 The favorites will again be the defending champions from Russia, UMMC Ekaterinburg. Teams have been split into two groups, Group A and Group B, with the champions finding themselves in Group B along with Russian rivals Nadezhda Orenburg who they defeated in the 2016 EuroLeague Championship game in what was one of the most thrilling final quarters of all time. Both groups will play in Round Robin system home and away. The four best-placed clubs from each group will qualify for the Quarter-Final Play-Offs. The 5th and 6th placed teams qualify for the EuroCup Women Quarter-Finals. The winners of the Quarter-Final Play-Offs will advance to the Final Four. Stayed tuned for our analysis and predictions for this season Euroleague Competition.